To see in color is a delight for the eye but to see in black and white is a delight for the soul. – Andri Cauldwell (b.1982) photographer. I always turn to working in black and white at this time of year when the colors of our world are still at their lowest ebb (at least in higher elevations). An accomplished landscape photographer was asked why he preferred to work in color. He explained that color photography is akin to non-fiction, while black and white photography is fiction -- and he preferred to capture the world as it is. There's an honesty to color photography. Black and white gives us an artificial, 'unreal' way of viewing the world. I think for many, that's the allure of it. It's seeing the world in a unique way -- and in the process we notice new aspects of a scene that were hidden or obscured by color: light and shadow, texture, lines, shapes, repetition -- all become more prominent as we remove the distraction of color. 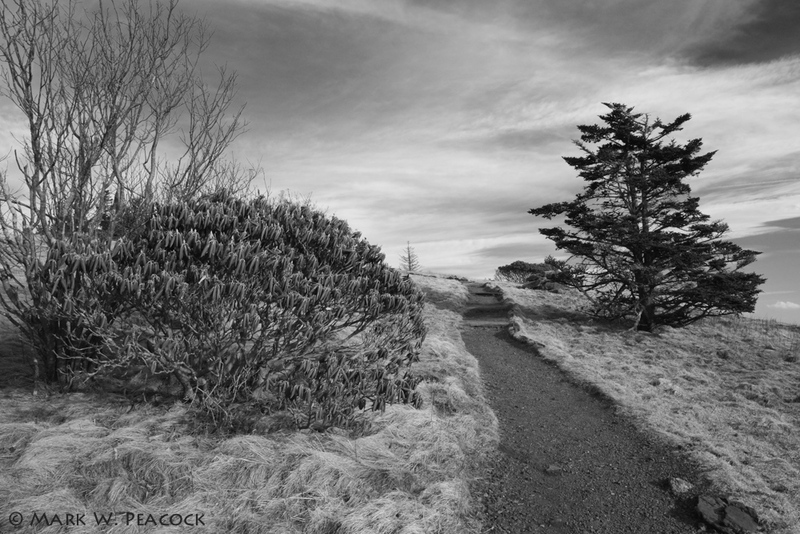 Above: Appalachian Trail near Round Bald in the Roan Highlands.